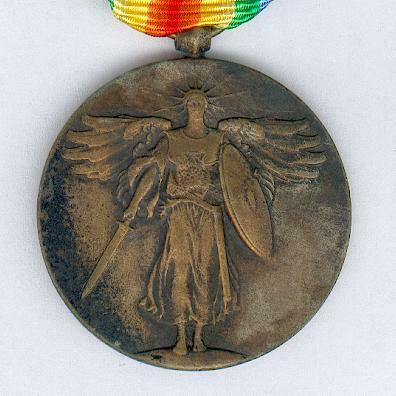 Circular bronze medal with replaced laterally-pierced knob suspension; the face with the winged figure of Victory; the reverse with a fasces imposed centrally on the U. S. shield, the names of the Allied nations to either side, circumscribed above ‘THE GREAT WAR FOR CIVILIZATION’, six five-pointed stars below; age-toned; on replaced correct ribbon. 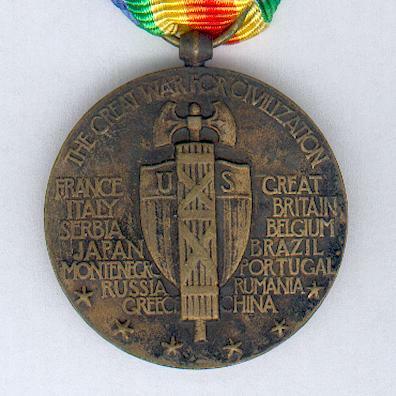 The idea of an inter-allied medal to commemorate victory in what was termed ‘The Great War for Civilisation’ is credited to the French Field-Marshal Foch. 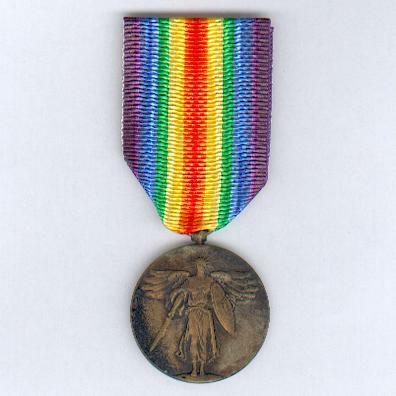 It was agreed that each of the Allies should issue a medal to their nationals featuring a figure representing ‘Victory’ on the front and have a symmetric double rainbow ribbon with red, the colour of courage and sacrifice at the centre, representing the colours of the allies flags and presenting an allegory of calm after storm. The original intention to institute the American version of the medal by Act of Congress never materialised and it was left to the Service Departments to do so by General Orders. This was done by the Army in April 1919 and by the Navy in June 1919, to be awarded for active service between 6 April 1917 and 11 November 1918. 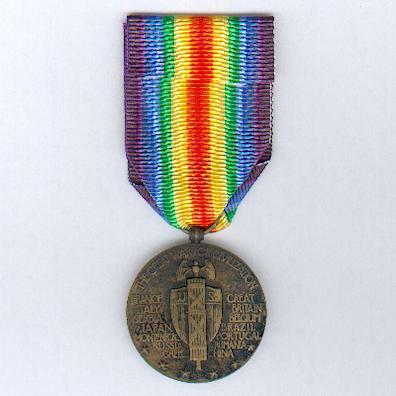 The award was later extended to those who served in European Russia between 12 November 1918 and 5 August 1919 and with the Expeditionary Force in Asian Russia between 23 November 1918 and 1 April 1920. It was designed by the eminent sculptor James Earle Fraser (1876-1953).